I first came across Pleiones at the Ballymena spring show and was instantly seduced, there on the bench stood a pan of naked ladies, holding there petals and sepals out like arms, announcing to the world ‘Ta dah’. I’m new to the world of alpines and am constantly finding amazing plants, which I think should be more widely gown. Is it that they are difficult to grow? To a certain degree, but I believe it is due to a lack of understanding their requirements. Let me impart what I’ve learned from my limited experience, second hand knowledge and the wonderful world of websites, ( check out “The Pleione Website”). 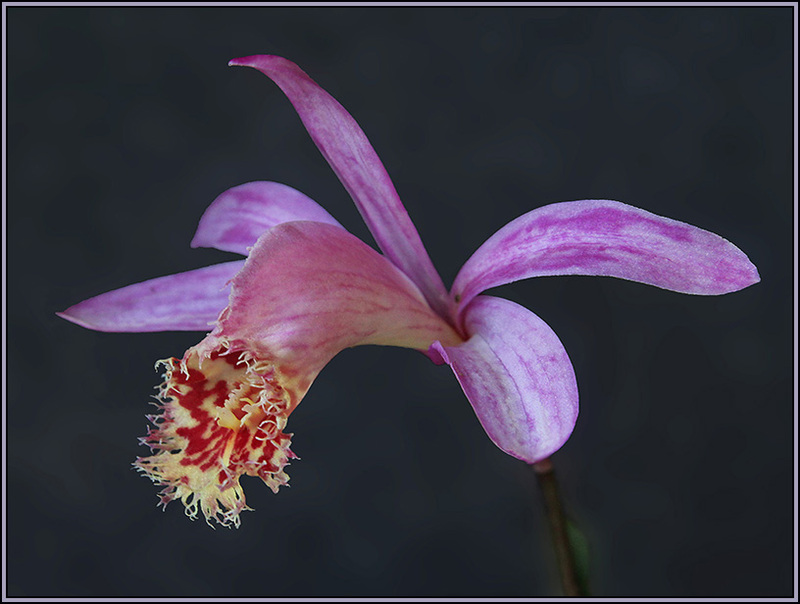 Pleiones are terrestrial orchids that originate in the foothills of the Himalayas, in a climate with a distinct spring, summer, autumn, winter. The growing season starts with the production of a flower spike. Soon after this the roots start to develop, which are unusual in the fact that only a certain number are produced each year and they are annual in nature (lose one through rot or damage and it ain’t coming back). Root production is followed by foliage, as the plant develops some modesty and the youthful flower fades after its few weeks of splendour. New bulbils form either side of the mother pseudo bulb, which shrivels as the season progresses. Towards the end of the growing season, foliage fades, roots shrivel and die and the pseudo bulb enters dormancy. Cultivation begins in February/March time with the planting of the newly acquired, or last season’s pseudo bulbs. Place with approximately 2/3rds of the bulb covered in an orchid based growing medium (3 parts bark, 2 parts shredded moss). Some people use whatever potting medium they have to hand, but I would suggest starting with something open and spongy to reduce the risk of the roots rotting. At this early stage watering should be sparse; misting is an effective method of keeping the pseudo bulb moist and avoiding root rot. Place somewhere frost free but not too warm, approximately 10 degrees C. Temperatures above this may cause early foliage growth and no flower, or a flower which browns and dies, before opening. As the flower spike develops, the pseudo bulbs can be gently lifted (paying attention to the roots) and orientated with the spikes facing the same direction to give a more appealing look. Wait with excitement until the flower opens (April/May), clap yourself on the back when it does, blame the pseudo bulb if it doesn’t, it couldn’t possibly be my instruction. Watering can be slowly increased as the foliage develops and in the summer they can be placed outside with a little shade where they will enjoy a regular dose of rain, especially with our climate. When the leaves turn yellow it’s time to stop watering and allow them to dry out. Feeding should take the form of the usual orchid mantra, “weekly, weakly”, when the foliage is well formed, a weak feed on a weekly basis. Approximately once a month do not feed but instead give the plant a good drenching to remove any excess nutrient build up. There is no need for special fertiliser just a balance liquid feed and an occasional foliar feed. Pleiones can be grown from seed but are an orchid and need flasking, this is something I am unfamiliar with, needing specialised equipment. Symptoms: includes deformed leaf growth, streaks, speckles and colour breaks. 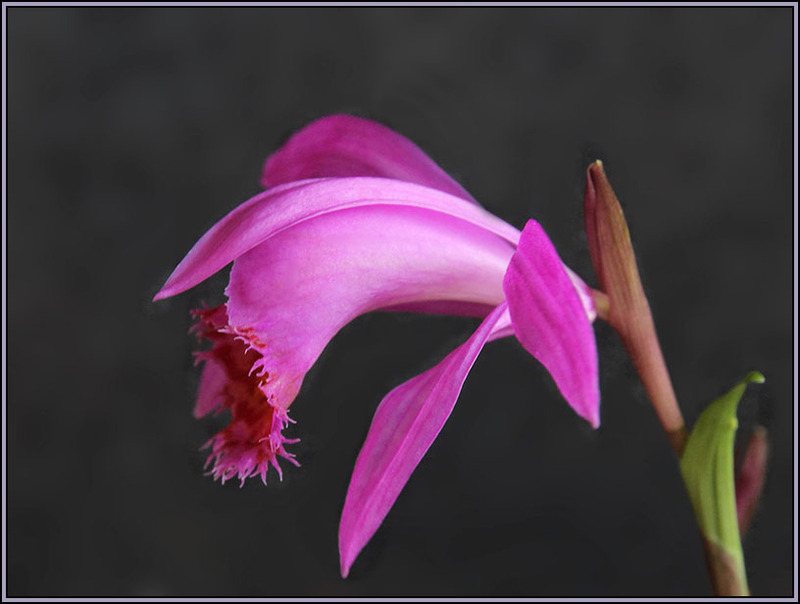 Pleiones are susceptible to viruses, for which there is no cure. Any infected pseudo bulbs will have to be discarded. Good housekeeping is the best solution, most viruses will be spread be sap suckers, so keep those suckers under control. Symptoms: small black dots that expand into pits on the surface of the pseudo bulb, leaves turn brown and often form concentric rings. Spread by spores, can be transmitted by water splashes. Treatment: Fungicides such as myclobutanil. Symptoms: damages cells during feeding, in severe cases brown area are created on the surface of the pseudo bulb, reducing its vigour. May transmit viruses during feeding. Treatment: chemicals containing refined oils are effective at suffocating these mites. 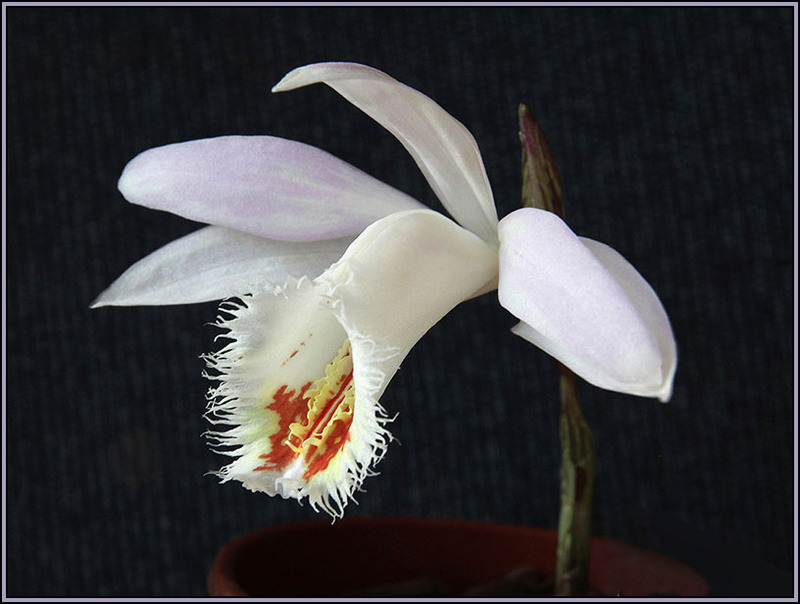 Pleiones can also be attacked by the usual suspects - aphids, mealybugs, slugs, snails and mice. They can be treated in the normal way you would deal with these pests.